Eutypa dieback and botryosphaeria dieback are major grapevine trunk diseases that threaten the sustainability of Australian vineyards. Causal fungi infect pruning wounds and colonise wood, causing dieback and vine death (Wine Australia, 2016). Vinehealth Australia fully understands that many growers are facing a current battle in managing these trunk diseases. Vinehealth’s Technical Manager Suzanne McLoughlin attended SARDI researcher Dr Mark Sosnowski’s presentation on current and future work on trunk diseases in Coonawarra on 22 March. Here she shares some of the ongoing work on eutypa dieback and botryosphaeria dieback. Research led by SARDI in collaboration with the National Wine and Grape Industry Centre, with funding from Wine Australia and industry, has focussed on developing practical management strategies for grapevine trunk diseases. High level findings are presented below on the final report of this latest work, entitled ‘Practical Management of Grapevine Trunk Diseases’ (SAR 1205), from February 2017. DNA-based molecular tools were developed to detect inoculum from spore traps, and showed that spore dispersal patterns vary in regions with different climates, highlighting the role of rain and the presence of inoculum over the entire year. Pruning wounds were highly susceptible to infection for the first two weeks, regardless of the pruning time, with susceptibility decreasing thereafter at various rates, depending on the pathogen. The application of the fungicides pyraclostrobin (Cabrio), fluazinam (Emblem) and tebuconazole (Folicur) to pruning wounds within six days of infection, controlled trunk disease pathogens for a total period of up to three weeks. In the short-term, remedial surgery was successful for control of botryosphaeria dieback on own-rooted vines, with further work required to improve regeneration of scion material on reworked grafted vines. Cultivar susceptibility to dieback varies, with potential for tolerance identified in some germplasm, and preliminary evidence of reduced susceptibility in some clones and rootstocks warrants further investigation. Increased water stress generally decreased the susceptibility of canes to colonisation by trunk disease pathogens, suggesting that drought and deficit irrigation practices are not likely to contribute to an increased prevalence of grapevine trunk disease in Australian vineyards. Continue surveillance of inoculum dispersal in the field and develop climate specific recommendations to minimise infection. The ability of fungicide adjuvants to maximise wound coverage. Critical timing of biocontrol application. Gathering results on the medium-term effectiveness of botryosphaeria dieback management using remedial surgery. Investigation into clonal and rootstock susceptibility. Establishing infection thresholds in propagation material that may lead to subsequent disease symptoms. ‘Managing Eutypa Dieback Grower Resource Kit’ including a video series and Factsheets compiled by Clare Region Winegrape Growers Association, supported through the Wine Australia Regional Program for SA North. Factsheet and video on ‘Experiences with Eutypa dieback’ produced by the McLaren Vale, Adelaide Hills and Langhorne Creek regions. 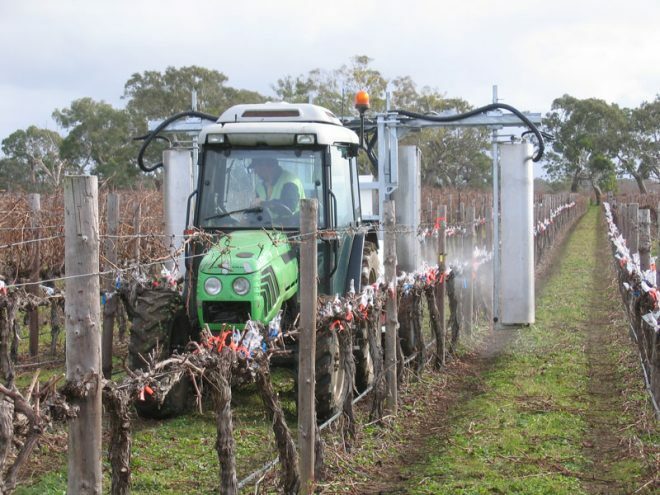 Sprayer applying wound protectant in vineyard, reflective of one of the greatest achievements of the trunk disease research group in improved strategies for industry. Photo courtesy M. Sosnowski, SARDI.